It would be battery powered. But in addition, it is designed to lift straight up like a helicopter -- so no need for a runway. Then, as the patent notes, the collection of rotors on top work with two facing backward to allow it to hover for a bit before cruising off to that grocery store. We are also hearing from sources that Google is involved, but in what capacity is unclear. However, Zee.Aero's offices are near Shoreline Lake in Mountain View,... Shoreline Lake is also where you'll find the sprawling Googleplex -- and not far from there, Google X, the super-secret facility that gave rise to self driving cars, Internet balloons and Google Glass. Sebastian Thrun, who helped start Google X and led the driverless car effort, has said he sees the majority of people using flying cars by 2040. Ilan Kroo, Zee.Aero founder, replied to an email in which he stated that it is not affiliated with Google or other nearby tech companies. However, Garling still has a semantic hope of Google's involvement. I followed up by asking, since the wording wasn't quite clear "Does that mean Zee.Aero is not affiliated with Google or you yourself are not affiliated with Google, or neither you nor Zee.Aero have an affiliation with Google?" 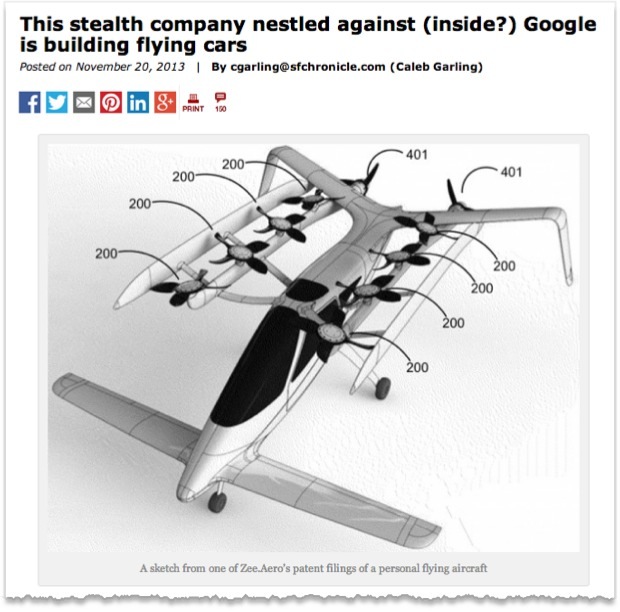 I'm sure that with the Google founders' penchant for exotic projects such as asteroid mining and life extension technologies, a flying personal car makes a nice addition. If not now then in the near future. And Google's self-driving car technologies would be perfect for a crowded airspace -- especially around the Googleplex with its close proximity to San Francisco and San Jose airports, not to mention the Google execs private hangar at NASA's Moffett Field. However, I'm still waiting for my jetpack. They promised us jetpacks when I was growing up.